It’s not my intention to teach you how to cook – because I am sure you know how! My intent is to help you think of recipes and ideas to help you stop wasting food. The less food wasted or more items re-purposed, the less money is spent replacing and rebuying. I find it fun to make a new recipe and use up all my leftovers or the seemingly unusable bottom of the box contents. 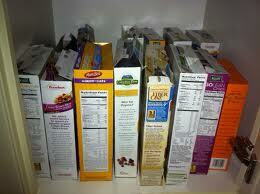 Does your cereal cabinet look like mine? 8 boxes of cereal and no box has enough cereal for a full bowl. My kids tire of he cereal and then move to the next box, leaving an almost empty box! Then what? Ah, you need my Bottom Of The Cereal Box recipes. I am SURE many of you have some great original “Bottom Of The Cereal Box” recipes — do share yours in the comments below or HERE!! Garbage Bars – no oven recipe. I don’t know where the name came from, it could be better. Grease a 9×13 pan and set aside. For easy stirring this sticky concoction, spray spoon/spatula with cooking spray. In a large, microwave-safe bowl combine the brown sugar, granulated sugar and corn syrup. Microwave on high for 2 minutes. Repeat again until the mixture bubbles and begins to boil. Remove from microwave and add and stir until smooth 1-1/2 cups peanut butter. Add the cereal/snack combination. In a small, microwavable bowl combine the chocolate chips and 1/3 cup peanut butter. Microwave for 2 minutes. Stir and if needed, microwave for another 30 seconds to finish melting the chocolate chips. Stir until smooth and spread over the bars. Heat oven to 350. In a large bowl combine sugar cookie mix, butter, egg mix into a soft dough. Add 3 cups any variety of cereal. Drop by the spoonful and cook for 8-10 minutes. AND suggest a NEW NAME for these recipes!! how about “bottom of the box” cookies?